I missed the season premiere of Girlfriend’s Guide To Divorce on Bravo last night but I plan to catch up on that as soon as I can. The other night actually, I watched the Girlfriend’s Guide To Divorce finale from season one which as usual when I watch this series, triggered one of my own divorce memories. This time, it was the memory of signing my divorce papers. My divorce process was long (almost four years!) which means you think about one day reaching an agreement but the idea of it always seems really far away. In my head I figured that when the time actually came to sign the divorce papers, I would bring a friend or my mom or my cousin with me to my lawyer’s office to sign away life as I once knew it. No way did I think I would be capable of actually signing my name to those papers on my own! And then, at what I thought was another routine court date appearance, I was basically forced to sign my divorce papers (to avoid going to trial) in the crowded cafeteria of the Supreme Court while sitting at a little table drinking really bad coffee with my attorney. I was not at all prepared! This was not how I envisioned it! We can mentally try to prepare ourselves for just about any circumstance but then things always happen out of nowhere, completely out of our control and we just gotta deal. The only thing that went as planned that day was my routine post-divorce court lunch at Red Mango. I always treated myself to Red Mango after court. May I please confess that I went to the Dunkin Donuts drive thru yesterday TWO TIMES for coffee. While only slightly nervous that the Dunkin Donuts drive thru girl with the crazy painted finger nails from the morning would remember me in the early afternoon, I realized I can’t be the only one to frequent the same drive thru twice in one day. I just NEEDED Dunkin yesterday. I had a terrible headache, I was feeling tired all over and I was blaming my Keurig coffee for not helping me. Dunkin Donuts made it all better within a few sips that by afternoon, I treated myself to another round. Remember when I used to share the funny text messages my son would send me at night when I was sleeping? Well, he really doesn’t do that anymore. 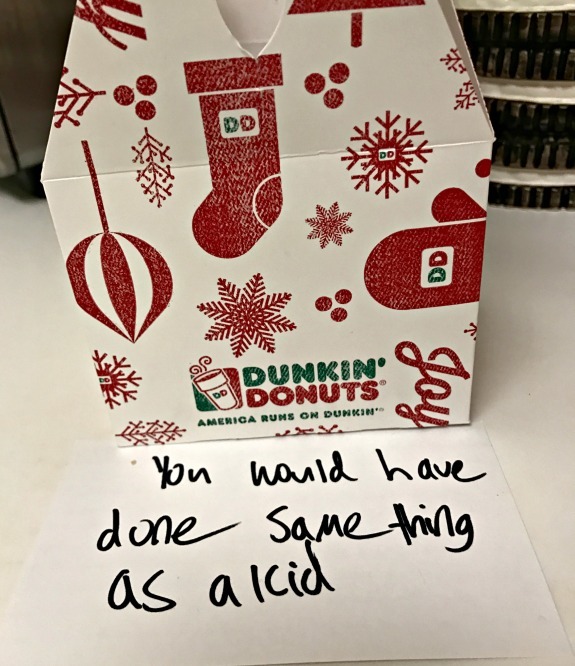 Instead he leaves me notes, like this one that I found in the kitchen next to the empty box of munchkins. I knew he would finish the munchkins that were left in the box! I knew it! 1/12/16: Winter Beauty Favorites < – Ahh, great round-up of beauty products including coconut oil which is so needed this time of year as a moisturizer! 1/12/15: That time I shared my chocolate fondue < – We know I don’t love to share that often. 1/12/14: That time my Keurig broke and I had no coffee < – Not a fun experience. Am I the only one to go through the same drive thru twice in one day?! How do you take your coffee? I just like a drop of almond milk or skim milk – no sugar. Favorite type of munchkin or donut? I love the chocolate munchkins! I dont really like Dunkin, but I have gone to Starbucks twice in the same day. Not sure if I have gone to the same one though. Your son is too funny!!! you are reminding me that I think I did go to another starbucks to refill my cup from earlier in the day one time! We live out in the country, so I guess we don’t go through drive thrus very often, but it’s always fun to do our Sonic drive thru for one of their epic milkshakes. THank you for sharing your struggles and journey; I know it’s not easy. thank you for always understanding! I can’t drink Dunkins coffee anymore, but every morning I drink my coffee black! I remember when I was little I loved the blueberry munchkins! I liked the powdered munchkins as a kid! We take our coffee the same way! I’ve definitely hit up the coffee drive thru twice in one day. Sometimes you just need two. No shame in that game! There is a Dunkin Donuts across the street from my mom’s condo that she goes to all the time. They know her well there and know me as her daughter so always hook me up with a couple free munchkins when I go in 🙂 Love the chocolate glazed and love the boring old fashioned! Dunkin Donuts coffee with skim milk, for whatever reason, is my comfort food/drink. Probably because it brings me back to taking walks with my mom and getting coffee partway through as a teenager and when I’m come home from college. We still do that when I come visit. I crave it when I’m having a tough day even though I usually prefer espresso and black coffee. I really like my dunkin coffee with just a drop of skim – always so good. I worked at DD for years in high school and college and I can promise you that plenty of people have a multiple coffee a day habit! No judgement here! Truthfully I love starbucks more but I live in MA where theres a Dunkins every 100 ft. I usually get a medium french vanilla dark roast black. Lately my coffee is just black or with a touch of coconut or almond milk. And I think the drastic weather change gave me a headache which it usually does, sadly even 3 coffees wouldn’t solve that for me! I miss DD coffee! We can buy the grounds out here but there’s not DD drive thrus. At least Seattle coffee makes up for that. I take my coffee black. I usually like plain chocolate donuts, but recently I tried an apple fritter and it was so good! yeah the dd coffee in the bags or even the k cups can’t compare to the stores! 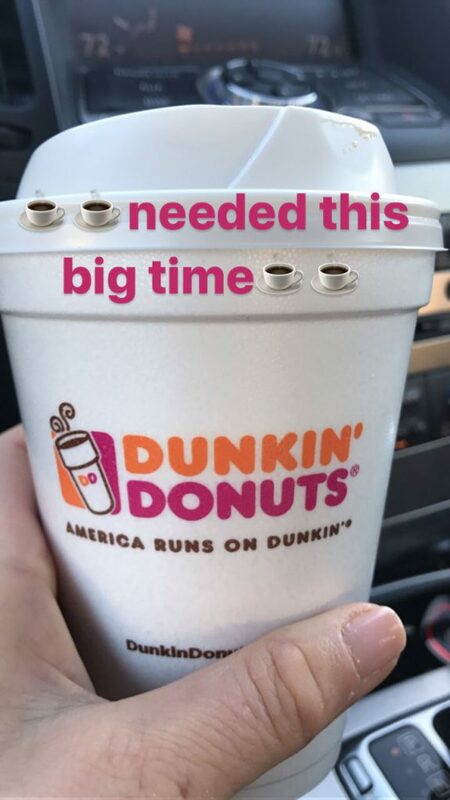 Dunkin Donuts coffee is great, honestly no shame in hitting up that drive thru twice, I say good for you. I take my coffee black but sometimes I’ll add a splash of half and half if I’m feeling it. I like Dunkin’s double chocolate donuts because chocolate donut + chocolate frosting = perfect amount of chocolate. I love their chocolate donuts, I always liked the chocolate crème filled the best! I love your kid! I’ve been to the same Starbucks twice in one day too many times to count. Okay and so your divorce went to Supreme court, eh? OUCH. So did Andrew’s. $$$$$$$$$$ We have to go back, because his daughter lives with us full time but her mom is still demanding child support. Nice eh? Kylah doesn’t sleep a wink over there, and has only seen her mom a few hours on Christmas Eve. Money turns people evil, I swear. omg how can she even try to demand child support when the child is living with you? unreal. divorce and co-parenting can be so challenging! If there’s one thing parenthood has taught me, it’s that nothing goes how you envision it. I would have eaten the mini donuts too. Yum.